When I heard of this rescue organization early in 2016, I was immediately curious and eager to meet the woman behind it all. The Louisiana Bobcat Refuge is a 501c3 non-profit and is the only species-specific bobcat and lynx rehabilitation & research center in the USA. Central to its mission is a surrogate program called AKP, which was developed by Pamela Kay Connery, the founder of LBR and an expert on bobcat and Canada lynx behavior. Pamela also works hard on conservation education, nationally and internationally concerning felids native to the USA. I finally got up the courage to contact Pamela this summer in hopes she'd be interested in a collaborative photo-documentary effort. I wanted to learn more about her abandoned kitten surrogacy program, and I wanted to see it for myself, especially after hearing it takes 1 year to prepare a kitten for reintroduction into the wild. A whole year! Lucky for me she was interested, and I soon found myself sitting in her SUV on a 3-hour trip to pick up an abandoned kitten that had been brought to Dr. Gia Morgan at WERLA in Shreveport. Pamela is the warm and personable sort of person who you feel you've known for years within the first few minutes of meeting her. She's also super smart and has an impressive background. Pamela graduated with honors from Louisiana College with a Master Degree in Teaching. 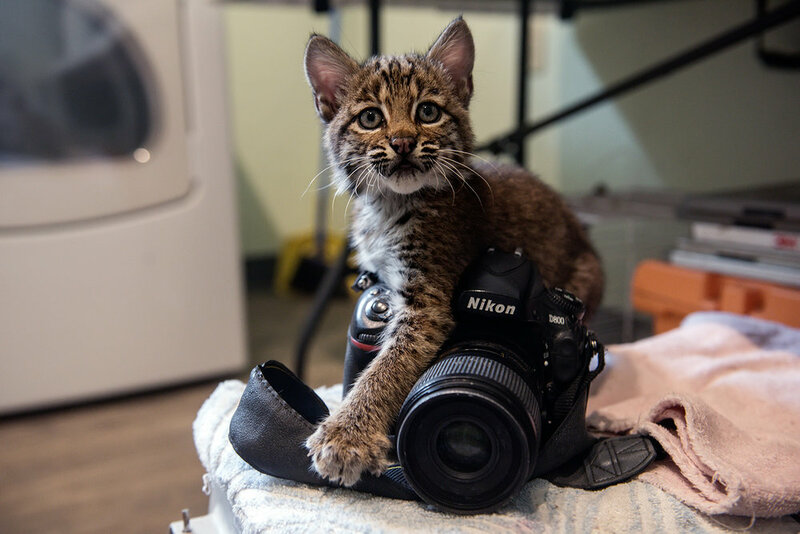 As for the wild cats, she is one of fewer than 20 species-specific bobcat rehabilitators in the United States and has more than eight years of hands-on experience with native and exotic felids. Pamela is also a NWCO bobcat live-trapper and holds an International Wildlife Rehabilitation Certification in Lynx rufus rehabilitation. When she began her journey to get certified in bobcat rehabilitation, she soon realized there was next to nothing known on the subject. She read every bit of literature on felid rehabilitation she could find, spoke with experts in the field, and learned as much as she could about the behaviors and natural history of the bobcat and the Canada lynx. She took that knowledge and her hands-on experience with the cats and began to develop what she would call the Abandoned Bobcat Kitten Surrogate Program (aka AKP) for the abandoned kittens. She is literally writing the book on bobcat rehabilitation. When we arrived at WERLA, Dr. Morgan and a few volunteers were busy tending to animals. After a quick tour, we were led to the bobcat kitten. I didn't really know what to expect. After a few minutes of observing the kitten observing us and our gear, she reminded me a lot of a domestic feral kitten. She was curious and rambunctious, but definitely a lot wilder and more strong-willed. Although cautious, she was eager to explore and play and claw and nibble, but I could tell Pamela would need to win her trust to be able to work with her. In the wild the kitten would normally be experiencing important play enrichment with her litter-mates. This play ultimately helps them learn key aspects of hunting. Pamela aims to rectify this lack of litter-mate enrichment through her surrogate program. As we sat on the floor and watched the tiny kitten make some rounds, she finally approached Pamela, perched on her knee, and they were properly acquainted. Pamela seems to have a special way with cats, something not many people have. As I watched their interactions, I could tell that the kitten trusted her, and I could also see the concern and genuine care Pamela felt for the kitten through her eyes and gentle gestures. I think we both could have stayed all day in that room, or just at the wonderful place called WERLA, but it was eventually time to head back for the refuge. As Dr. Morgan walked us down the long driveway to the car, I got a real sense of the bond between these two wildlife rehabbers. 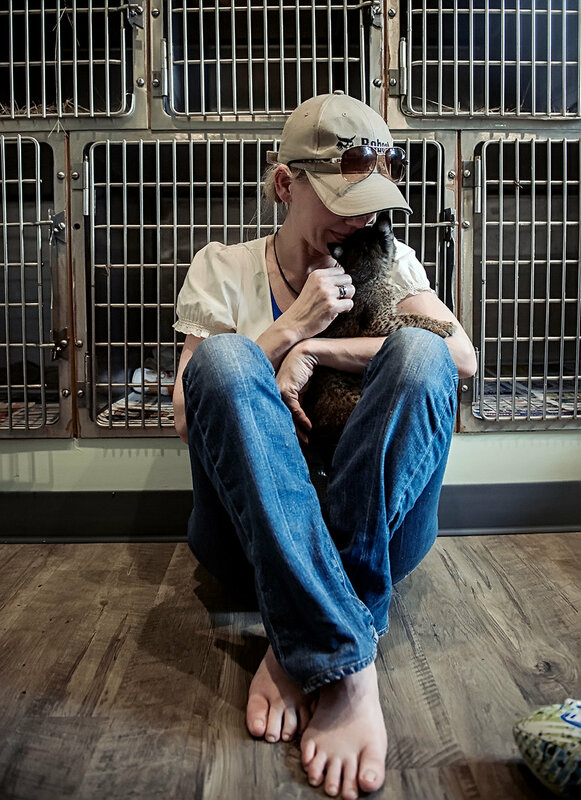 Pamela has taken in a few bobcats from Dr. Morgan before, as well as helped in the release of WERLA opossums. They talk often to share expertise. That quid pro quo relationship confirmed for me that wildlife rehabilitators are a rare breed, and they need the interaction and exchange of ideas between each other because, let's face it, although it's a rewarding existence, it is also at times isolating and stressful. Having the moral support of a few like-minded souls seems a very necessary part of any wildlife rehabber's life. Once back at the refuge, I was able to watch Pamela engage in enrichment activities with the bobcat kittens. She literally becomes a surrogate parental figure to these kittens for a time. This is the first step in her AKP Surrogate Program. Regarding her surrogate role to bobcat kittens Pamela says, "Even though it looks like fun, I am building a bond with a kit that is necessary in its rehabilitation process. Having interactions with one assigned person (AKA surrogate) is enrichment and stimulation for them on many levels. I have to win their trust, but as they mature, I begin to distance myself and transition them to a habitat where they are no longer touching me, but are interacting gradually with a surrogate bobcat which will eventually take my place..."